Huron 1958 was selected as one of two great teams from the state’s past to be honored as a Team of Excellence by the South Dakota High School Basketball Hall of Fame during the organization’s 2016 banquet. The Tigers of Coach Carold Heier finished with an undefeated 22-0 record after winning the Class A state championship. Team members who also won the Eastern South Dakota Conference were, from left, Don Tschetter, Dale Schwartz, Dennis Busch, John Ehret, John Fuglsang, Nick Brod, Don Barry, Rex Swett, Al Mason, Tom Martin, Larry Keelin and Bill Madden. Kneeling is student manager Charles Pease. Gary Munsen, among the most successful and well-known coaches in the history of South Dakota basketball, died at his Mitchell home on Jan. 12, 2016. He was 72. An outstanding athlete at White Lake High School, he went on to graduate from Dakota State University. While in college he developed a love of coaching while serving as a student assistant under longtime Trojans coach Ed Harter. Munsen began his career in education at Marion. 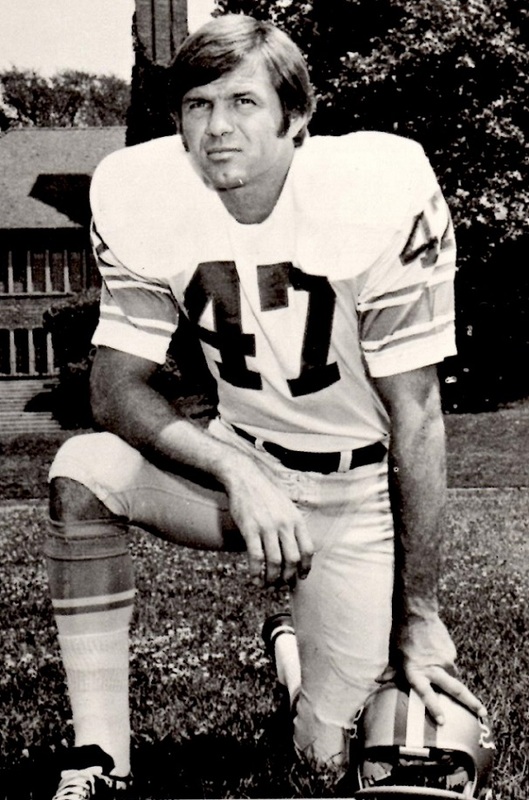 He then moved to Mitchell and coached the Kernel boys from 1974-2012. During that time Mitchell won nine state championships. Munsen’s career record as a boys coach was 672-254. The Kernels also won three additional state titles while Munsen was serving as girls coach from 1989-2001. His record with the Mitchell girls was 230-71. With a combined boys and girls record of 902-325, Munsen was the overall winningest coach in state history. His 12 combined state championships is also a state record. 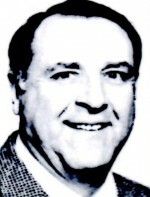 Munsen guided the Kernel boys to 18 Eastern South Dakota Conference titles while his Mitchell girls teams won seven ESD championships. The South Dakota High School Basketball Hall of Fame will induct 19 new members during its seventh annual banquet at 1 p.m. on April 2 at the Ramkota Hotel in Sioux Falls. That will increase membership in the Hall of Fame to 117 of the most accomplished boys and girls players in the history of the state. Included among the former greats in the Class of 2016 is Wayne Rasmussen, an all-state player at Howard High School. Later as a collegian at South Dakota State University he was named the Most Valuable Player in the 1963 NCAA College Division National Basketball Tournament held in Evansville, Ind. Rasmussen, now of Brandon, graduated from Howard in 1960. He led South Dakota State to the national championship during his junior season. Also a football standout in high school and college, Rasmussen went on to a 10-year career in the National Football League as a defensive back for the Detroit Lions. To be recognized at the banquet as Teams of Excellence will be two of the state’s all-time greatest teams: the 1958 Huron Tigers and the 1926 Salem Cubs. Ticket information for the banquet will be announced soon on this website. Holly (Sivesind) Borchers, Sioux Falls (Sioux Falls Roosevelt High School 1993). Elton Byre, Sioux Falls (Reliance High School 1956). Amy (Allard) Carmody, Grosse Pointe Park, Mich. (Jefferson High School 1982). 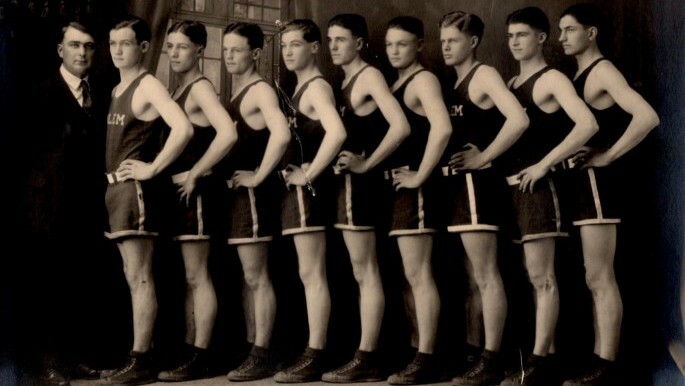 Conrad “Cornie” Collin* (Huron High School 1930). Roger Faber, Bloomington, Minn. (Canistota High School 1958). Melissa (Olson) Guebert, Apple Valley, Minn. (Sioux Falls Lincoln High School 1983). Dale Hall, Wagner (Ravinia High School 1954). Maury Haugland, Lead (Murdo High School 1954). Fred Hecker* (Sioux Falls Washington High School 1957). Steve Jansa, Sioux Falls (Sioux Falls O’Gorman High School 1964). Matt Jones, Brookings (Alpena High School 2001). Bob Marske* (Andover High School 1944). Chris Miller, Louisville, Ky. (Stickney High School 1971). Scott Morgan, Mitchell (Mitchell High School 1989). Josh Mueller, Arvada, Colo. (West Central High School 2001). Wayne Rasmussen, Brandon (Howard High School 1960). Rudy Soderquist* (Rapid City High School 1937). Lolly Steele, Pine Ridge (Pine Ridge High School 1984). Harley Zephier Sr., Aberdeen (Dupree High School 1955). All editions of SoDak Sports are now available for public viewing. They can be seen in the South Dakota High School Basketball Hall of Fame meeting room 2110 at the Sanford Pentagon in Sioux Falls. Hall of Fame officers above prepared the collection for display at a recent work session. From left are secretary Wayne Thue, vice president LaMoine Torgerson, president Bob Swanhorst and executive director Dave Wagner. SoDak Sports was a weekly newspaper that chronicled all sports statewide. It was published during 1952-54 and was the creation of Al Neuharth, the Alpena High School graduate who later became founder of USA TODAY. The Hall of Fame is located on the ground floor of the Pentagon. The meeting room is on the second floor, along with additional memorabilia in the corridors. Normal hours at the Pentagon are 8 a.m. to 5 p.m. on Monday through Friday. To arrange a tour of the Hall of Fame or a time to inspect the SoDak Sports collection call (605) 467-3010. December marks the 30th anniversary of the crowning of one of our all-time greatest state champions. That team, the 1985 Brookings Bobcats, is featured in the 2015 Fall Newsletter published by the South Dakota High School Basketball Hall of Fame. Coach Jim Holwerda (right) and his Bobcats brought national attention to the state. USA TODAY ranked Brookings as the No. 3 girls team in the country. Three of the team’s stars – Amy Mickelson, Renae Sallquist and Paula Kenefick – went on to major collegiate programs. Read about the undefeated Bobcats in our newsletter that was sent Nov. 23 to the nearly 1,000 people on our mailing list. The newsletter is free and is published in the spring and fall. There are many other items of interest in the newsletter. Such as a story about 1953’s five state champions. A look at the special bond that existed between a town and a college 30 miles away. Remembering a small school that cherished basketball before its doors closed forever. And a profile of a retired U.S. Air Force Major General who used his South Dakota upbringing as an essential resource in a journey through big-time collegiate basketball and a distinguished military career. We hope you find many things to enjoy in the newsletter. Phase I of an ambitious project by the South Dakota High School Basketball Hall of Fame has been completed. 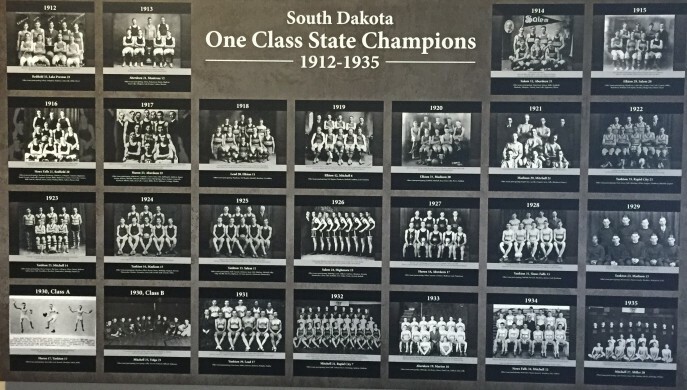 The 40 x 70-inch panel shown above honors state championship teams during the one class era from 1912 through 1935. The panel is on permanent display in a second floor corridor of the Sanford Pentagon. Phase II is underway and will focus on the Class B champions from 1936 through 1960. When that panel is completed and exhibited, Phase III will target the Class A champions from that same period. There will be seven panels in all. When the entire project is completed all boys and girls championship teams prior to the start of the three class system in 1985 will be included. 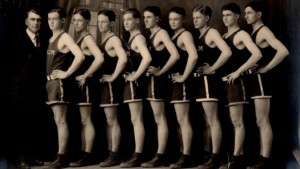 Also featured will be the Catholic state tournament champions from 1937 through 1964. Plans are being made to also recognize all three class champions. 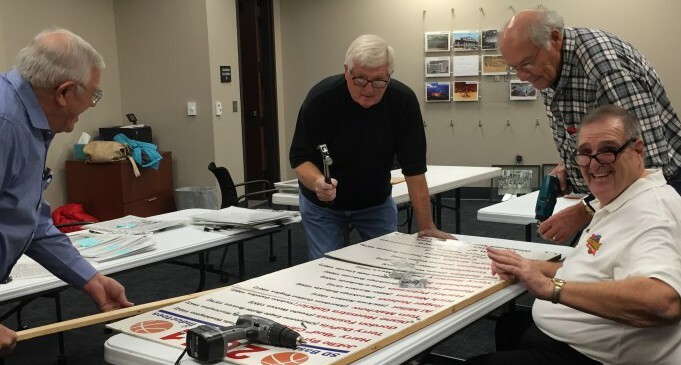 The panels will contain 8 x 10-inch pictures of each championship team, rosters, the final score of the championship game, and a list of the other schools that also participated in the tournament. The South Dakota High School Basketball Hall of Fame has teamed with the Jostens Co. to create an elegant ring which commemorates membership in our elite Hall of Fame family. 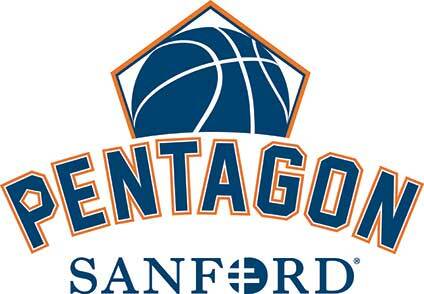 Features on each ring include the person’s last name and the year they were inducted, along with an insignia of the Sanford Pentagon, which serves as the home of the Hall of Fame. A replica of the Hall of Fame logo is crafted on the side of the ring while the top stone includes a basketball symbol surrounded by the words ‘South Dakota Hall of Fame’. The person’s full name will be engraved on the inside band of the ring. Any member of the Hall of Fame will be proud to own and wear such a meaningful reminder of the day they were inducted. Each ring is meticulously constructed of beautiful, enduring white metal and costs $274.54 including tax. Hall of Fame members and their families and friends can order a ring by simply mailing the name to be inscribed, the year inducted, choice of stone color, and the desired ring size to SDBBHOF, 2210 W. Pentagon Place, Sioux Falls, SD 57107. The purchaser should include his or her name, mailing address, email address if applicable, and telephone number. Payment can be made via check or by using the PayPal option located on the right side of this website. Enshrinement in the Hall of Fame is a great honor. This ring will be a reminder and will become a cherished keepsake. San Antonio won the 2015 Las Vegas Summer League by defeating the Phoenix Suns 93-90 in the championship game on July 20. 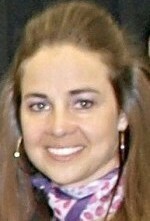 The Spurs were coached by Becky Hammon, who is a charter member of the South Dakota High School Basketball Hall of Fame. Hammon was a Rapid City Stevens star who played collegiately at Colorado State University. She was a standout in the WNBA with the New York Liberty and the San Antonio Stars. Hammon, 38, became the first woman to be a full-time assistant coach in the NBA when Spurs coach Gregg Popovich added her to his staff prior to the 2014-15 season. The Summer League is an important proving ground for young NBA players and prospects. Jonathon Simmons, a 6-foot-6 guard hoping to make the San Antonio regular-season roster for the upcoming season, led the Spurs with 23 points against Phoenix. Parker High School’s basketball program was a model of consistency under the direction of Gayle Hoover (right) for more than three decades. The Pheasants won 577 games and averaged 17 victories per season. Hoover was a rarity in that he spent his entire South Dakota coaching career at the same school. He guided the Pheasants for 34 years. The 2015 Spring Newsletter of the South Dakota High School Basketball Hall of Fame examines Hoover’s career and legacy through the eyes of five of his former players. Friends of the Hall of Fame receive the newsletter at their home. It was mailed June 3. The newsletter is free and published twice yearly. If you do not receive a copy and want to be added to our mailing list, email your name and home address (not your email address) to dlwagner@tnics.com. Or phone executive director Dave Wagner at (605) 467-3010. The newsletter also features several other noteworthy stories. Among them are a look at Yankton’s dominance of the one-class era; a 1925 team that did not win a title but may have been the state’s best; Wakonda’s 101-game winning streak; and a man who learned about basketball in South Dakota and then became one of California’s greatest coaches. We think the newsletter delves into topics that are of interest to all who love the game. We hope that you agree.